Pros - Reflects like glass, Lighter than glass, shatter resistant, can be laser cut in virtually any shape. Cons - Not as rigid as glass, can scratch more easily than glass. 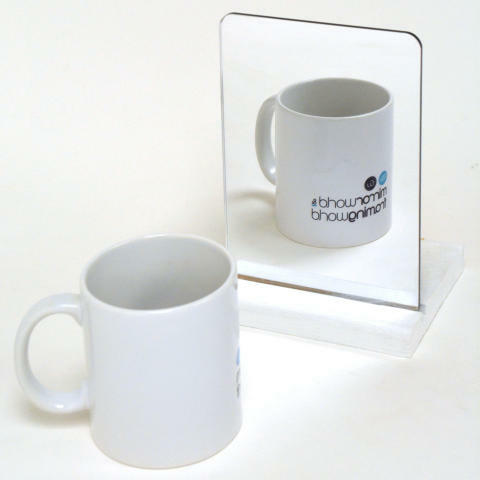 For more information, take a look at our acrylic mirror information sheet, in the information section of the site. At Mirrorworld we endeavour to deliver your mirror as quickly and safely as possible. However, this can vary dependant on a number of factors. The vast majority of our mirrors are delivered from stock including our superfast 24hr option but a few other circumstances can influence our deliveries. We care greatly that your mirror arrives in pristine condition, so large or especially fragile items are upgraded, FREE of charge to our 'White Glove' delivery service. In essence, this means we hand deliver your mirror right to your door ourselves, potentially bypassing a heavy handed national courier. The small consequence to this excellent service could mean waiting an extra few days for a delivery. We cover 95% of addresses within the UK between 10-14 days. If you need to know when we are delivering in your area, our knowledgeable sales staff will be pleased to assist with our schedule details. Where the items are labelled 'Due In', this means items may be delayed a few days whilst mirrors undergo final assembly processes and quality checks before being dispatched. Where items are labelled 'To Order' or 'Made to Measure', these items are ONLY manufactured once an order has been received. We can normally do this within 5-7 days but some items such as our Art Deco range and Bevelled Tiles can take up 14-21 days manufacturing time. If you do require a quicker service, this is often possible but please do check BEFORE you order to avoid disappointment. Mirrorworld want you to be completely satisfied with your purchase. In the unlikely event you wish to return your item for any reason, we operate a 14 day no quibble returns policy in which you may return your goods for up to 14 days from receipt, for a full refund. Please see Mirrorworld terms and conditions to view our complete returns procedure. Please note:- Goods that are bespoke, made to order or made-to-measure to your specific requirements are unfortunately not covered by this returns policy and are non-refundable. When ordering these type of items please check carefully your sizes and specifications BEFORE placing your order. Items found to be faulty will be replaced or rectified free of charge. ALSO POPULAR IN THIS COLLECTION..
Money Off Voucher Code For Made To Measure Mirrors.